The A side hears emcee's Oxygen, UGeorge and Audessey rejoicing in expression "The struggle builds character when you weather the storm, so write on" The music, funky as ever pushes along with an anthemic horn line enhancing the emotion of the moving message. 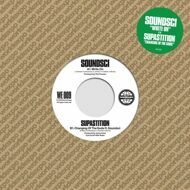 The B side 'Changing of the Gods' debuted on Soundsci's newest member Supastition's LP The Gold Standard from 2015. Supastition's infectious energy hits you immediately with Ugeorge and Oxygen adding pure fire on this golden nugget. Dj Ollie Teeba adds the finishing touch with some precision cuts, letting you know that the crew are ready to show & prove at the drop of a dime.